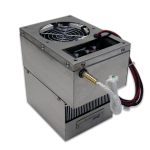 In this example, the customer is using TECA’s AHP-1800CPV to keep a 60 pound lithium ion battery cool during R&D testing. This saves the customer the trouble of using a plate with pumped coolant to cool the battery, which was the original method. 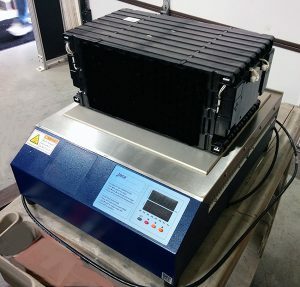 The customer reports that upgrading to the TECA AHP-1800CPV “makes testing much easier”. 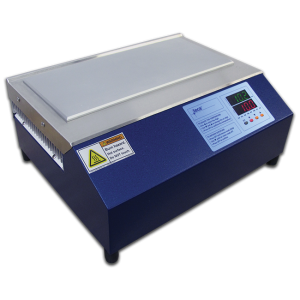 The AHP-1800CPV is the largest thermoelectric cold plate on the market with a plate surface area of 12.80 x 13.30 inches. 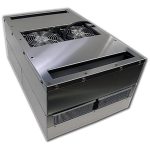 The large surface area and robust cooling power were ideal for this application. 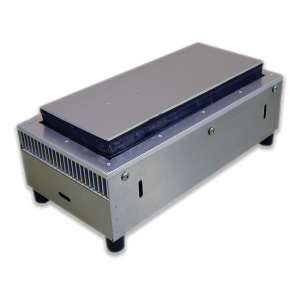 The customer makes fiber optics and related components and subsystems, they use an AHP-1200CPV cold plate for testing components. 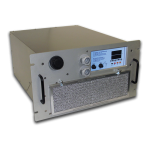 They are using it to run temperature test on them, they set the temperature, and it goes to temperature and sits there, heating or cooling. “It works well”. Before they were cobbling together home brew solutions with a heater here, a circuit and a fan there but it’s nice to have a system that does it all. 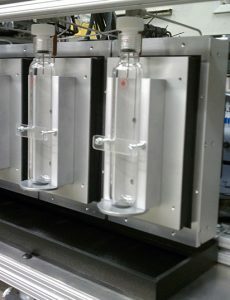 An oil refinery runs tests on asphalt samples at different temperatures. 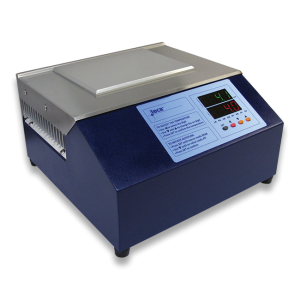 TECA Model AHP-301CPV Cold Plate is currently being used during the course of the customer’s testing. 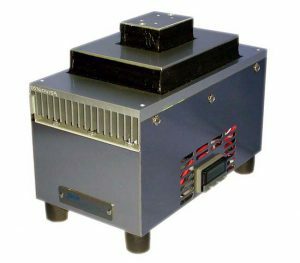 The customer makes high performance crystal oscillators and atomic clocks for satellites and laboratories and they needed something for temperature control and stabilization. They found TECA and the AHP-301CPV, tried one and say it is “working fantastic”. Well enough to order more for production, quality and engineering tests. 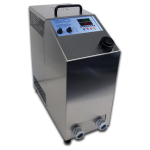 They use them to maintain a stable temperature of the oscillator which in turn provides a stable frequency. 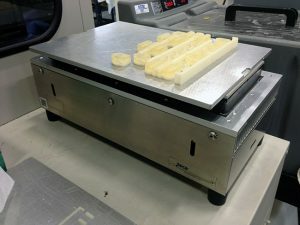 A product design engineer at a medical device company needed a way to cool wax blocks holding film. 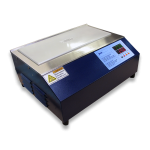 The wax is printed directly onto the customer’s aluminum tray. 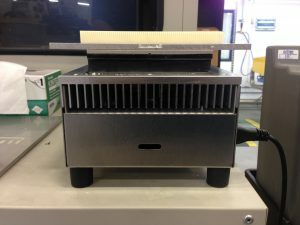 Before discovering TECA products, the customer was placing the aluminum tray in a refrigerator and mechanically removing the wax by scraping it off with a metal blade. 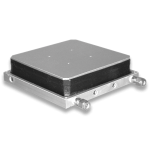 TECA’s AHP-1200CP Cold Plate is a better solution. 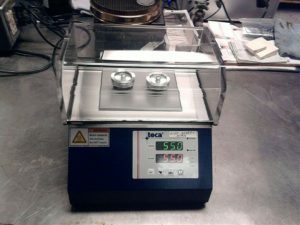 The customer is happy to have found an affordable cold plate to dedicate to his cooling task. Please view the video provided by our customer to see how quickly and easily the wax is now removed (no more scraping!). 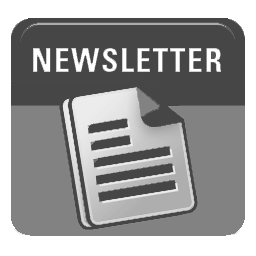 Customer needed to test low-temperature performance of inertial measuring devices. 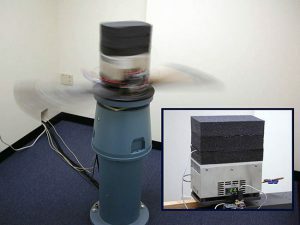 In this application of low temperature thermoelectric cooling; the user is testing inertial measurement devices over a temperature range. 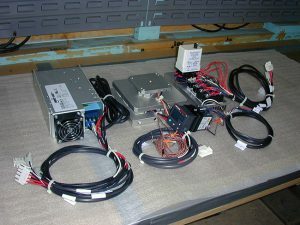 The devices as well as the TECA cascaded cooling assembly are subjected to various rotational and acceleration stimuli while device temperature is controlled. 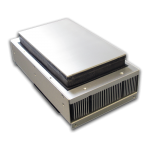 The custom thermoelectric cold plate cascaded (Peltier cascade) was built up from a standard Model AHP-301CP cold plate. 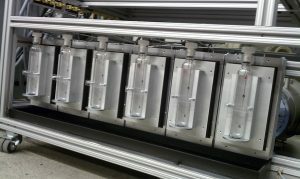 The finished test fixture was able to function with a maximum rotation rate of 1700° per second and 50 g acceleration. The rotation is evident in the photo. 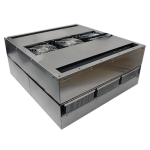 By using a standard product as the basis for the cooling system, higher costs associated with a custom solution were avoided. Some engineers at Lucent wanted to cool devices inside a vacuum chamber and they didn’t want to reinvent the wheel. TECA’s been making devices like that for decades. 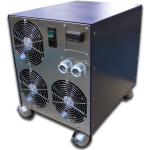 They had a load of 10 to 20 watts generated and wanted -40 °C with about 15 °C to 20 °C water available. 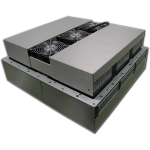 A Custom LHP-800CP / LHP-300CP cascade, controller and power supply were supplied for a reasonable cost in a reasonable time frame.